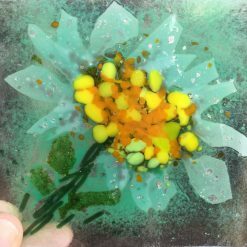 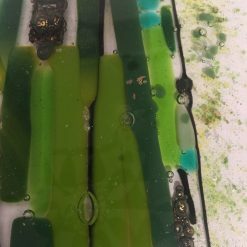 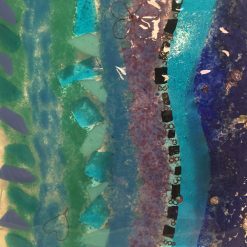 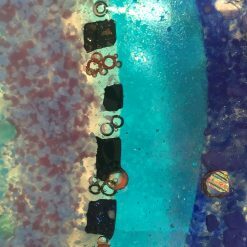 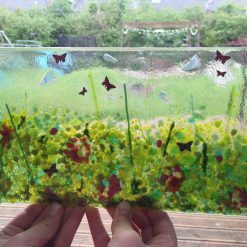 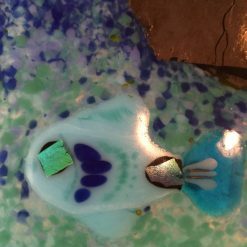 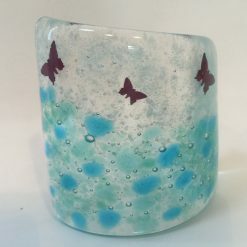 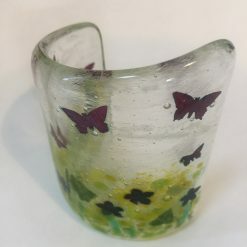 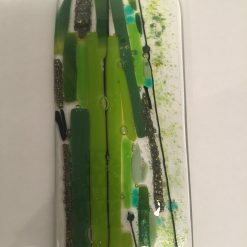 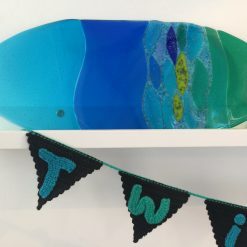 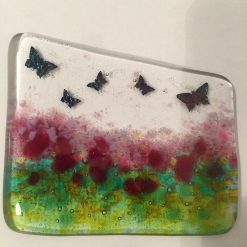 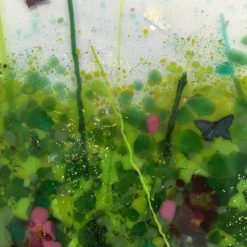 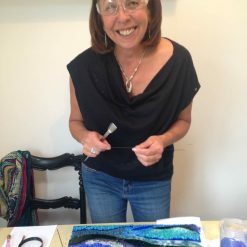 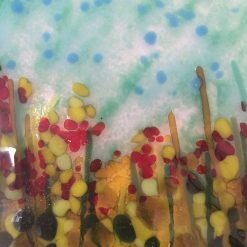 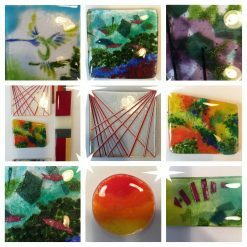 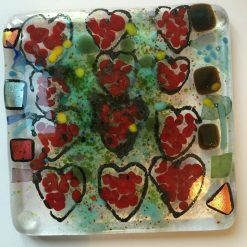 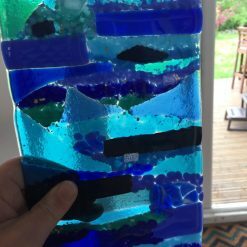 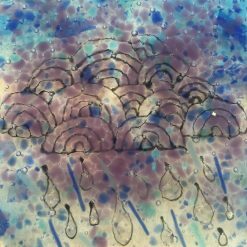 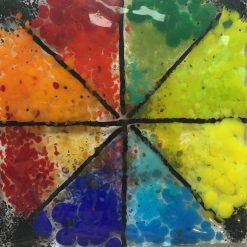 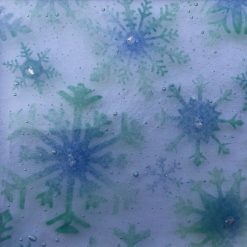 During a two hour workshop, you will be shown the basics of fused glass, it is a hands on workshop, with no eno experience necessary. 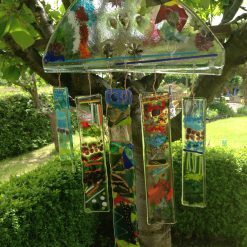 You can expect to make a hanging decoration, using a base piece of pre cut glass and then add decoration with frits, stringers and confetti. 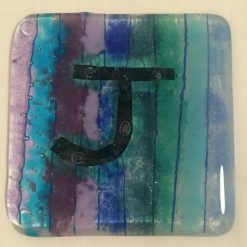 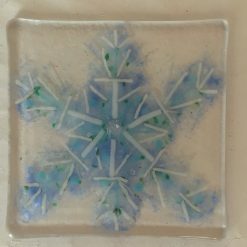 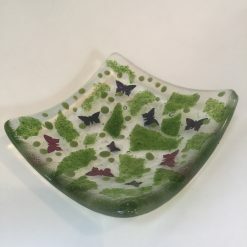 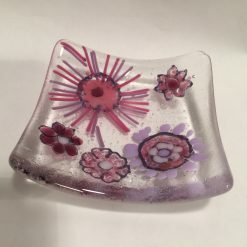 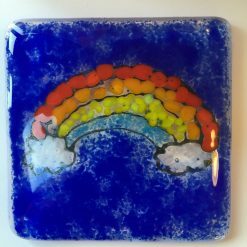 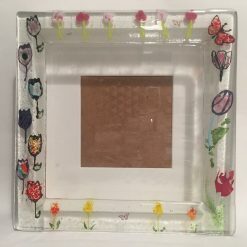 You will then be able to choose to make one item from the following list – a coaster, small dish, candle arch, 12×12 glass art. 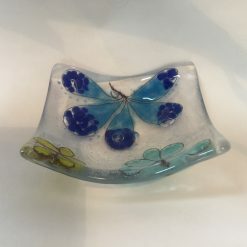 Upgrade to include or make more than one item – pocket mirror, bottle stopper, key ring, Large candle arch, glass wave, dish, bowl, candle bridge, wall mirror, photo frame, glass art etc. 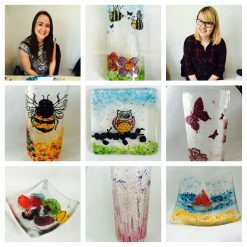 See below for examples of students work. 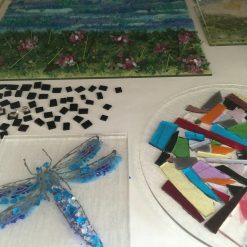 Extra items can be made in one session, price list available for all items. 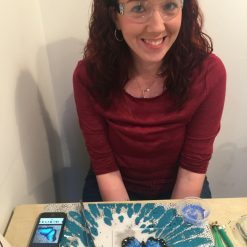 Once you have learnt the basics you, can attend as many workshops as you like and promptly get started with your project. 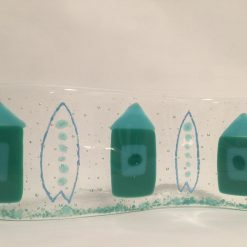 Lantern, Bowl, Candle arch, Set of four coasters, Glass wave, wall art, Platter. 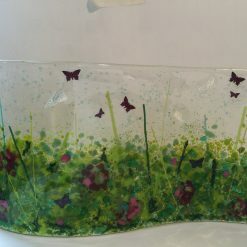 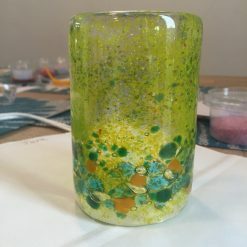 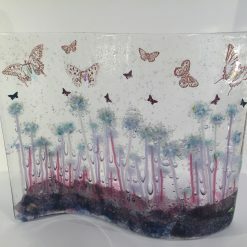 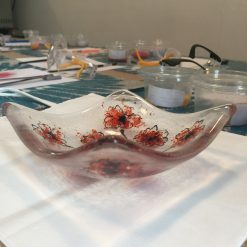 When you feel like you would like to work on a larger scale, in more detail or more advanced techniques you can book a 4hr workshop.The price includes a tekta base of up to 30x30cm and glass for decoration. 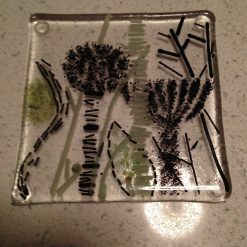 A glass supplement is payable for larger projects or multiple pieces, prices on enquiry. 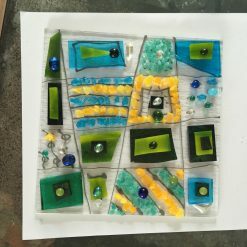 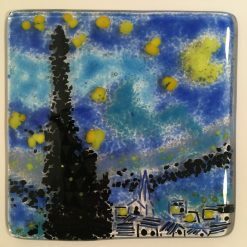 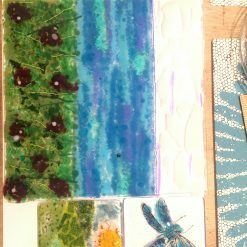 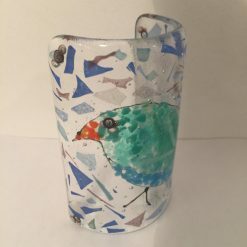 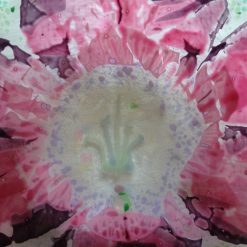 This workshop offers a wonderful opportunity to make a variety of pieces ranging from dinner ware, lanterns or a large wall panel or framed piece. 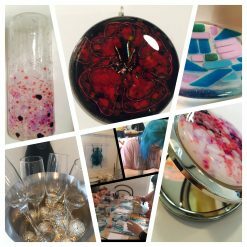 You will gain an understanding of the materials, techniques and processes involved. 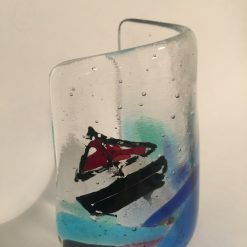 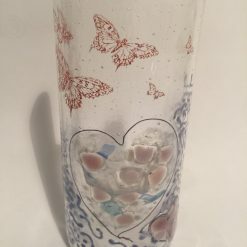 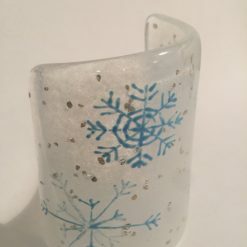 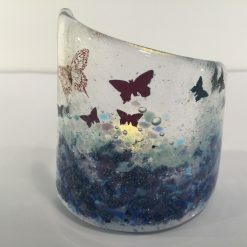 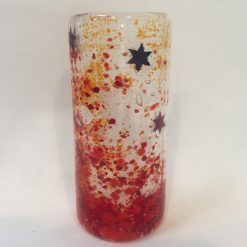 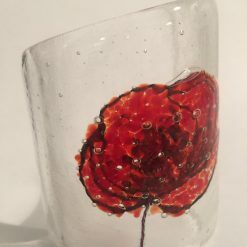 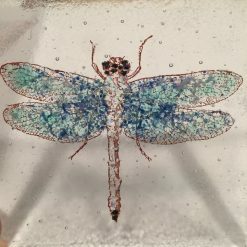 Using sheet glass, frits, stringers, wire and glass line, you will be shown how to cut glass, add inclusions and create voids & bubbles, while producing your own masterpiece! 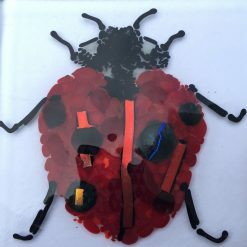 I will be your tutor for the day, I have a fine art degree, a PGCE teaching qualification and have taught pupils from the age of 5yrs, GCSE, A level, further education and those that love to learn, what ever their age. 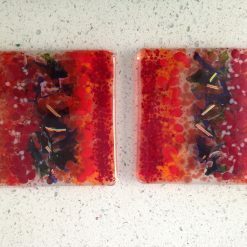 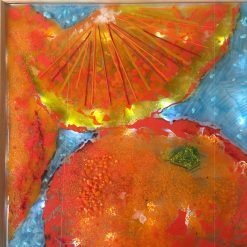 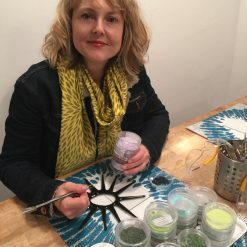 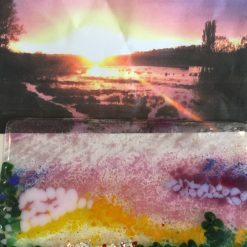 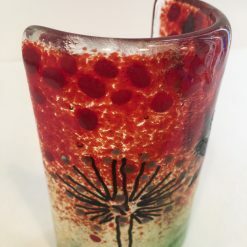 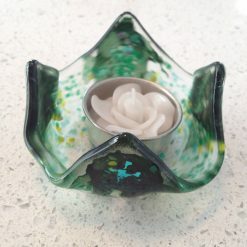 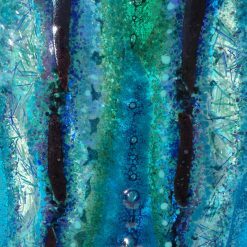 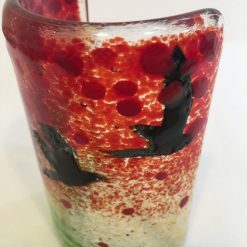 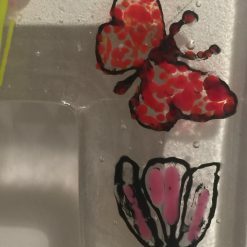 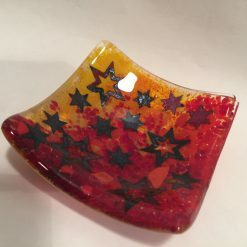 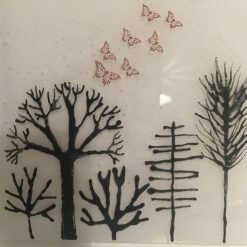 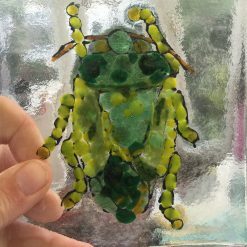 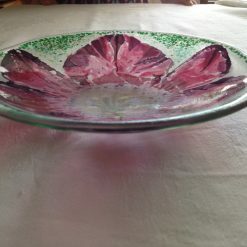 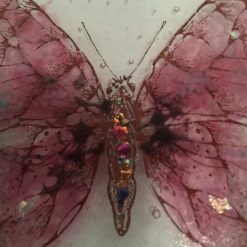 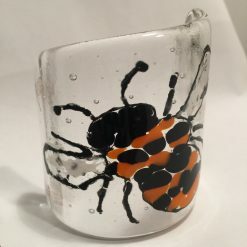 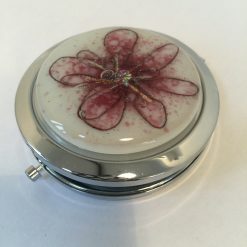 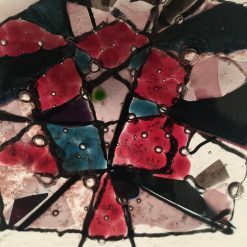 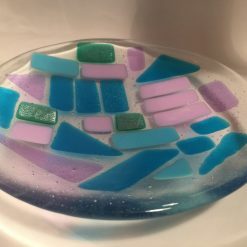 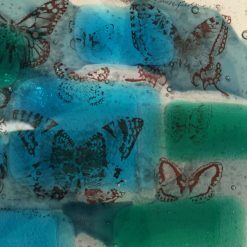 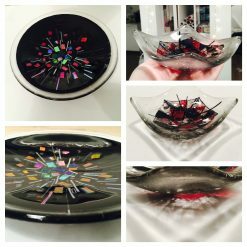 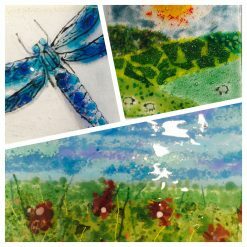 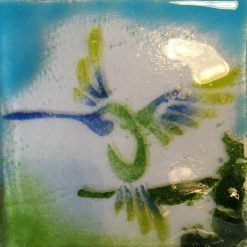 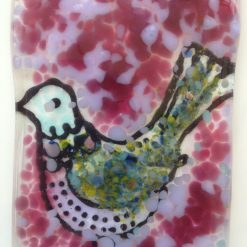 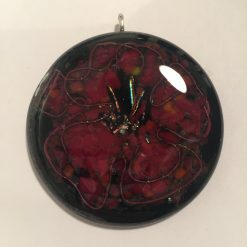 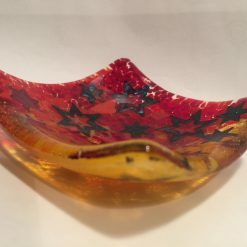 I have developed my own tips and techniques , I will share these techniques with you, and take you step- by-step through the glass-fusing process so that you can create your own unique piece of fused glass art. 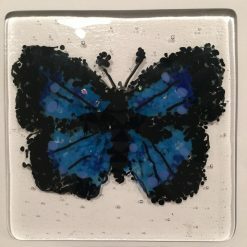 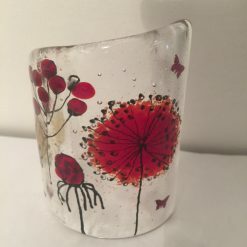 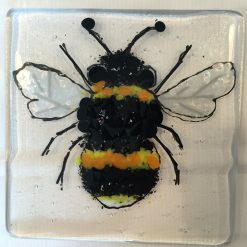 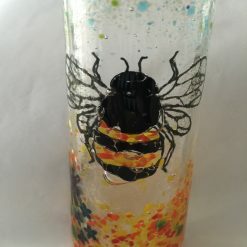 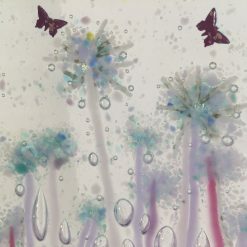 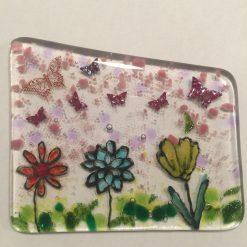 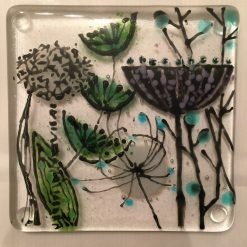 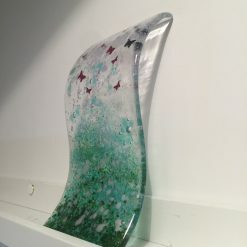 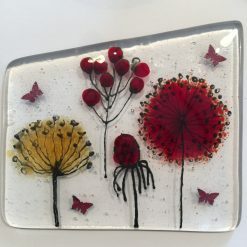 You will be making your own unique glass wall-hanging, size of 30cm x 30cm is included in the price or you can upgrade to 60cmx30cm for an additional £30 or to the maximum size 60cmx40cm for an additional £50 . 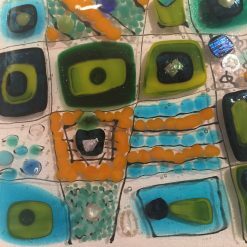 You can create any design that you wish, perhaps taking inspiration from pieces in the studio, browsing on the ipad or bringing images with you. 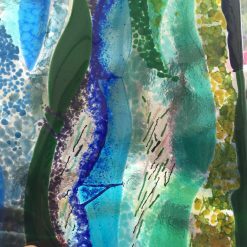 The course normally runs from 10.00am–4.00pm but I am flexible on times to suit your travelling arrangements. 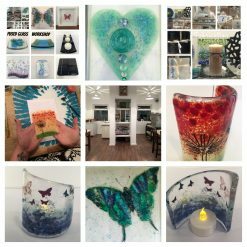 Twice Fired studio is located in Farsley, Leeds, it is easily accessed by car and is a short stroll from the train station. 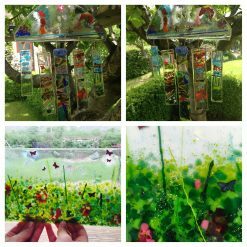 The studio looks over a large garden, where chickens roam freely, it has been described as a little oasis, It’s a lovely way to spend the day. 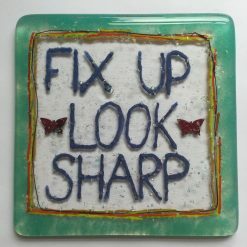 All materials and tools are provided( up to 30x30cm, additional £30 for 60cm x30cm and an additional £50 for 60cmx40cm. 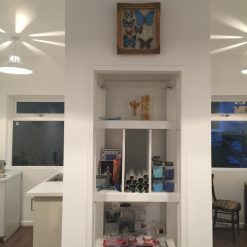 Refreshments are freely available throughout the day, To keep you fully fuelled a booking can be made at either of the two local fantastic eateries or lunch can be provided at the studio for a small additional fee, depending on requirements. 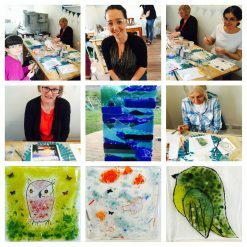 You are booking a personalised day, if you have any special requirements please ask. 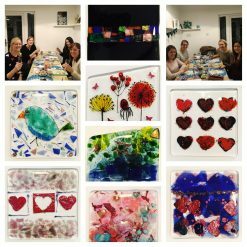 Twice Fired studio is also the perfect venue to hold a celebration, whether its a birthday party, Hen do or just a special occasion workshop you are after, email me your enquiry and we can put together a personalised package. 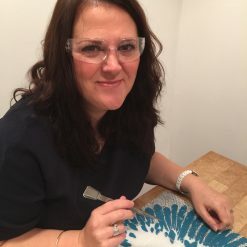 ( complimentary prosecco for groups of 6 or more ) can teach you a particular technique or guide you through a project, to be discussed before.